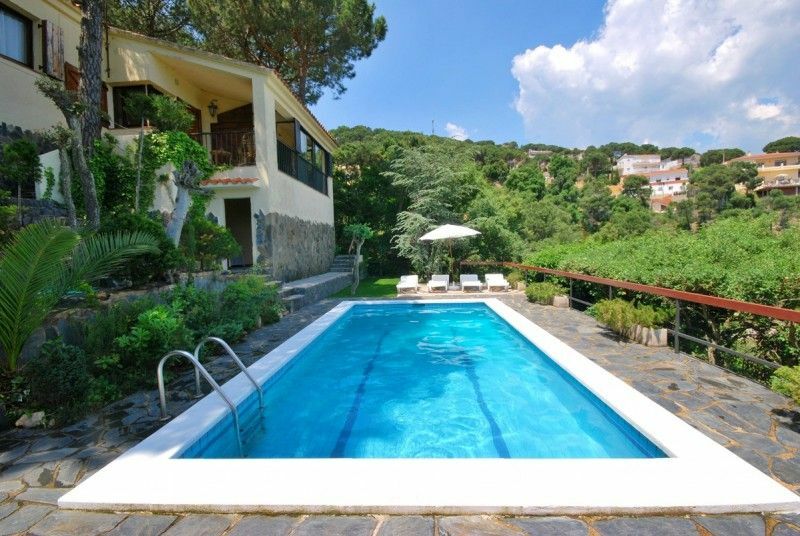 Attractive villa Julia near Lloret de Mar with private pool and amazing panoramic view over green hills. A villa with lots of privacy. Lazy sunbathing in the warm sunbeams on the vast sandy beaches, swimming and paddling in the cool Mediterranean, undertaking adventurous water sports and many other fun activities. Cultural and historical sights, specialized restaurants to enjoy a lovely diner and Spanish culinary delights. Immersing in the exuberant nightlife of famous resort Lloret de Mar. All this seems only confined to the Jet Set, who sojourn to the truly breathtaking Costa Brava every summer. But you don't have to be jealous, because you can also experience such an ultimate holiday advantageously! Fully detached villa Julia is an attractive, modern and comfortable holiday home that can accommodate nine people. Ideal if you should want to celebrate your summer holiday with multiple families or a group of friends. Social gathering can be combined with sufficient privacy for everyone. You have several terraces at your disposal, a balcony and your own spacious private pool at the rear of the villa. Villa Julia is located below street level. You can reach the entrance to the first floor via a short staircase downward. The holiday looks of this house, both practical and authentic Spanish, will surely bring you into a joyous vacation mood. Julia has a warm yet sophisticated atmosphere, caused by the timber elements and cosy fireplace in the rustic living room. On the same floor you will find well-equipped kitchen, 3 bedrooms and 1 bathroom. On the ground flooryou can find another living room, 1 bedroom and 1 bathroom. You bake some snacks on the barbecue in the lovely garden and drink Sangria together during the idyllic evenings, meanwhile enjoying the amazing views over the green Costa Brava hills. Your villa is located on a quiet street in the beautiful Serra Brava area, built on a hill along the coastline between Lloret de Mar and Tossa de Mar. Julia is perfect for an unwinding holiday and to escape the hustle and bustle of everyday life. You are surrounded by a mountainous landscape and the sandy beach of Canyelles is only 3000 meters away. In the breathtaking surroundings you can go for long walks, horseback riding or mountain biking. For tennis enthusiasts there are several courses in the neighbourhood, next to a communal pool and a restaurant. Lloret de Mar is of course well known for its vibrant nightlife, broad sandy beaches and countless (water sports) activities. But the renowned city is a true paradise in many more areas. You can shop at heart's content in the maze of narrow streets, stroll along the beach promenade and enjoy a drink at one of the pleasant terraces. Lloret was founded from pre-Roman settlements. In the old town you can still visit architectural treasures like the church of San Roma, the castle of San Joan and several cute hermits chapels. The environment of Lloret de Mar is also well worth your while. The fishing village Tossa de Mar (11 km) and typical Catalan village Vidreres (15 km) simply belong on your must see list because of the age-old traditions and the awesome latitudes. You will appreciate a visit to the botanical gardens of Marimutra in Blanes, with over 3000 plant species. And a trip to Barcelona, just 80 km away, is also easily made. After reading such nice things about villa Julia and the Costa Brava, you must surely be looking forward to your summer holiday there! Book your vacation in Villa Julia now with Club Villamar!